Publishers: Green Board Game Co.
Boost your memory in 10 minutes! 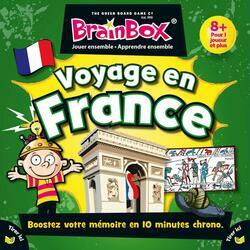 With Brain Box games, players observe a card for 10 seconds and then answer questions that require their memory. Observation and memory games accessible to all. To develop players' knowledge of the world, nature... A principle that puts young and old on an equal footing. Contents of the box : 72 illustrated cards, 1 hourglass, 1 die, 1 rule of the game.